I first made it to Portland in August of 1993. We had just moved to Bend, Oregon to snowboard at Mt. Bachelor for that upcoming winter, secured our gear and whipped up to Government Camp, then down to Portland. That first night in the city, we went to LaLuna to see Monster Magnet, Raging Slab and Paw. And I remember how easy it was to park. And the great records stores. And the telephones plastered with upcoming rock shows. And cheap places to eat. And how cool the August night was. I was hooked. The next five winters in Bend, coming up to Portland every couple weeks was an escape. To see concerts, get art supplies or just get lost around the city. When I moved here in 2002, after summers in Alaska on that godforsaken train, a couple years in Minneapolis going to art school, then a couple years making snowboard magazines in Southern California, I felt like I was coming home. Instantly comfortable. I loved the rain, the gray, the grime, the progressive politics, the quirk and the slow pace. And I finally made a poster for the city I love so much, jam-packed with everything I love about the place. Thank you for making a little room for me, Portland! 01. Printed on thick, durable, uncoated white 100# cover stock! 02. Four colors! Inspired by “big win streamers” at Blazers games . 03. 18” x 24” in dimension. 04. 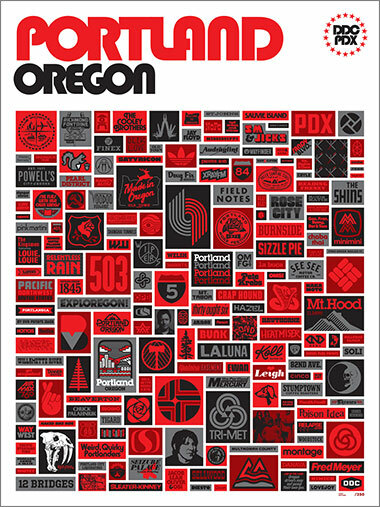 Proudly printed by Portland buddies at Seizure Palace just two blocks from the shop! 05. Get in a little closer right here: Click here for a detailed view. 06. Does the job for that See-See Coffee break room, Fred Meyer loading dock, Powells Books “Purple Room” wall, Sellwood 6-year-old’s bedroom, Poler flagship store, Mini Mini storage room wall, St. John’s bungalo, 82nd Avenue convenience store bulletin board, Les Schwab tire joint waiting room, Roseway craftsman, DDC factory floor, Sandy Blvd. Antique mall entryway wall, Red Fang practice space or wherever you hang yer head in this incredible city. 07. Dedicated to the city I’ve loved since 1993. ©2016 DDC Dry Goods Div., Merch Dept., Portland, Ore.